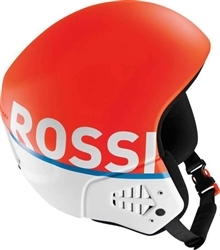 The HERO JR is a lightweight, ski racing helmet with an exact-fit designed to keep junior racers comfortable and safe. Featuring Hard Shell ABS technology and a Race Fit, the Radical Jr closely wraps the head down to the cheeks for greater protection. Air Flow ventilation channels provide constant circulation of air without cold spots or direct contact with head, providing increased comfort and temperature regulation. A precise, aerodynamic fit with fixed earpads that closely wraps the head to the cheeks for increased protection. The external ABS shell (approximately 3mm thick) and internal absorption foam (PSE) are separately injection-molded then assembled. This allows the appearance of the external shell to be less affected by impacts, while making it easier to incorporate vents. Front helmet vents draw air through ventilation channels between the two liner layers, providing consistent air circulation without direct skin contact for more comfortable temperature regulation.